Our webinar program seeks to educate members on relevant breast cancer advocacy issues and propose next steps and ways to take action. We continue to engage and educate both new and returning members on various topics including Toxic Cosmetics, Safe Chemicals, Inequities in Breast Cancer, The Oversimplification of Screening Mammography, Think Before You Pink® and more. Our webinars are always free and open to the public. 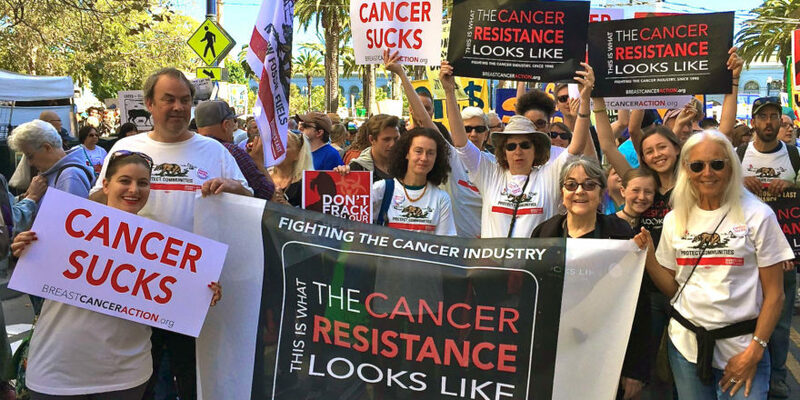 Upcoming webinars will include, The Connection Between Fracking and Breast Cancer on April 29th & 30th and Breast Cancer Media Literacy on May 29th & 30th. Check our website for more information and to view past webinars. Twenty-three advocates from across the country have joined BCAction’s Speakers Bureau to help change the conversation about breast cancer and identify emerging breast cancer issues in their local communities. Speakers have been hosting events all over the country from house parties to tabling to facilitating small discussions on various breast cancer advocacy topics. For more information about the speakers bureau program and how to apply, contact Sahru Keiser at skeiser@bcaction.org. Please see this issue’s Member Perspective highlighting current speakers and learn more about why they are passionate about ending the breast cancer epidemic. BCAction provides concise, science-based information on critical issues to people concerned about breast cancer. We provide a crisp analysis of important breast cancer advocacy topics by challenging assumptions about the disease and inspiring change to address and end the breast cancer epidemic. Each factsheet provides a general overview and framing of the topic, a clear and consistent foundation of information and BCAction’s insight and perspective. We encourage you to share the following factsheets, available in PDF format, with friends, family, co-workers and your larger community. We love feedback on how our educational materials are useful to you and your community. Send us an email to info@bcaction.org and let us know how you are using our factsheets. Hydraulic fracturing or “fracking” for short is a destructive method of extracting oil and gas from deep within the earth. Fracking is a growing problem across the country because the process involves polluting groundwater with a cocktail of chemicals, including chemicals linked to causing breast cancer. We are proud to stand up and demand an end to the practice of fracking, and insist that the health of women, and all people, comes before corporate profits. Read more about our anti-fracking work in this issue of The Source. BCAction is a plaintiff in the case against Myriad Genetics, owner of the current patent on the two human genes BRCA1 and BRCA2 (commonly known as ‘the breast cancer genes’). Myriad’s patent is an obstacle to scientific research on the breast cancer genes and a barrier to progress in research to address the breast cancer epidemic. This case goes before the U.S. Supreme Court on April 15th, and BCAction will be in Washington, DC, rallying to raise visibility for the issue and our work to outlaw gene patenting. We expect a decision from the Supreme Court sometime this summer and encourage everyone to stay tuned. You can read more about the case and our rally at the Supreme Court in this issue of The Source. The Think Before You Pink toolkit provides activists with ways to take action that hold pinkwashers accountable, deepens the understanding of the politics of breast cancer, and pose questions that reveal exactly where valuable pink ribbon dollars go and whether they work to address & end this epidemic. In 2012, we distributed over 10,000 toolkits to activists around the county. Click here to download your free copy today!